Brynn Duncan is not joking when she says she's allergic to life. 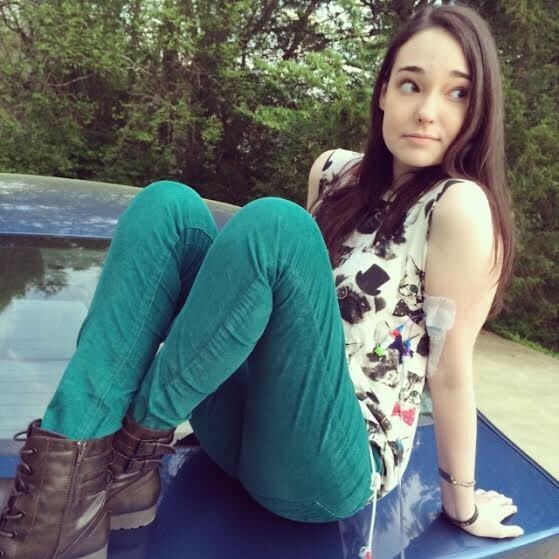 At just 20-years-old, Brynn has several serious chronic health conditions, one of which requires her to have a feeding tube and be one of the only people in the world to have a 24/7 Benadryl intravenous drip. She is, essentially, allergic to the world around her. The one that at 20, she should be on the cusp of fully embracing. She is wheelchair-bound a lot of the time, due to a condition called Postural Orthostatic Tachycardia Syndrome (known as POTS) -- which makes her faint if she stands for more than a few minutes at a time. Her more complex medical history is strewn with long sought-after diagnoses like Mast Cell Disease and Ehlers-Danlos Syndrome: conditions that you've probably never heard of. Brynn wants to change that -- she wants to bring awareness and support to her condition(s) through the power of positivity and speaking out about her own experience. And that's exactly what she's doing. I first started following Brynn on Instagram because I, too, am a young woman dealing with a chronic, progressive disease. There is a community of us on the Internet, some like to refer to us as Spoonies. Our stories often echo one another's deeply: years spent learning to advocate for ourselves because doctor's either weren't listening or just got it wrong. Horrendous hospital stays, missed days of school, special occasions of youth that should have been exciting that were overshadowed by pain or illness. Many of us do not have romantic partners. Our social lives could be called "limited". Some of us have supportive families, but even still, we worry always about being a burden. One thing that immediately set Brynn apart was that she was nearly always smiling. 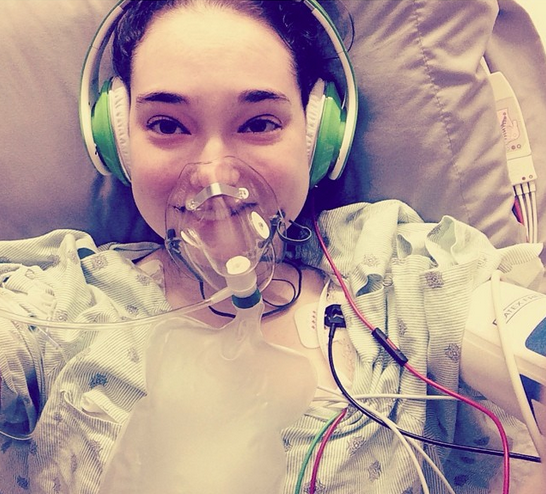 Even in a hospital bed, wrapped up in tubes and wires, she looked peaceful, if not always happy. On her blog, Brynn's Bubble, she mentions how the name for her blog came about, "When I developed the two illnesses, my friends would always joke that I needed to either live in a bubble or cover myself in bubble wrap before ever leaving my house!" Reading her experience in her own words and seeing her life play out on her Instagram, I found myself thinking often, I wonder how Brynn's doing? The strange relationships of the Internet often make us privy to people's lives at the most intimate times -- sometimes joyous, others not. The chronic illness folk I follow on social media I often find in my thoughts. I wish they were geographically closer to me -- and they may feel the same, though we all know that with our pain, chronic fatigue and other ailments even if we lived next door to each other it would probably be too much for us to get out of bed to let them in! So, I reached out to Brynn via email and asked if she'd be willing to talk with me about what her life is like today --how she's doing. Not only was she enthusiastic about the questions, but about having another avenue by which to share her story -- and hopefully, continue to create awareness about her conditions. First things first, though: let's take a journey through the medical record of Brynn Duncan and unravel the mythos of her conditions. Sometimes called Dysautonomia, Postural Orthostatic Tachycardia Syndrome causes your heart rate to increase so much when you change positions (like going from sitting to standing) that your whole body is thrown off kilter and you're likely to faint -- or, at the very least, become very light-headed and weak. Sometimes, POTS is paired with Postural Orthostatic Hypotension, which is similar but involves a drop in your blood pressure upon standing that can cause you to faint. We all, at times, have experienced dizziness if we stand suddenly after sitting for an extended period of time, but true Dysautonomia is far more troubling. Often, those with the condition, like Brynn, find it easier to use a wheelchair so that they don't have to risk passing out several times a day when changing of position is required. Think about how many times a day you go from sitting to standing -- even if an office job. It's a lot more than you think. Well, first of all, what are mast cells? When you have an allergic reaction to something, say, you're like me and you're seriously allergic to cats, your body's response to the allergen exposure begins inside your body and can expand to affect your lungs and breathing, your nervous system, your digestive tract and your skin -- think of the itchiness of hives! Mast cells, or, mastocytes, become active during an allergic reaction. They are full of two important elements of an immune response to an allergen: histamine and heparin. Unlike other types of white blood cells, which circulate in our blood, mastocytes are in tissues -- mucosal tissues (like in our noses). When prompted to do so by the presence of an allergen, mastocytes release those histamine reserves and that causes tissue swelling, warmth and redness that we associate with an allergic response. In extreme cases, of course, this leads to anaphylaxis. People who has Mast Cell Disease, essentially, have too many mastocytes that are at this responsive (or degranulated) stage in their body all the time. This means, a person's risk of going into anaphylaxis is very high, because their body is constantly just at the brink of it. Ehlers-Danlos Syndrome is a congenital condition (meaning you're born with it) that affects the connective tissues of the body. In people with EDS, they don't have enough collagen in their skin, muscles and joints for them to work effectively, so they may have joint hyper-mobility, skin sensitivity and slow wound healing (making them prone to infection) chronic and often debilitating musculoskeletal pain and even issues with major organ systems, which rely on collagen to stay in place inside the body cavities. An interview with Brynn Duncan. When did you first start to get sick? I had always been a "sickly" kid, but my symptoms did not get out of hand until I received a TDAP vaccine at the age of fifteen. When the more alarming symptoms presented themselves, it became clear that something was seriously wrong. I had no idea that it would take seven years of actively searching for answers before I was given the diagnosis of Mast Cell Disease. Can you describe what the diagnosis process was like? It was very difficult to arrive at my diagnosis. I saw doctor after doctor and none of them had answers for my bizarre medical problems. My parents found out about Mast Cell Disease in 2012 after years of researching my symptoms online. If it weren't for information about the disease on the internet leading me to the right specialists, I would likely still be undiagnosed! Once I received a diagnosis from a mast cell specialist, we later learned about a connective tissue disease called Ehlers-Danlos Syndrome. After an eight-week hospitalization this summer (seven weeks of that stay being in the ICU), I was given an official diagnosis of Ehlers-Danlos Syndrome. Doctors have recently discovered a link between the two diseases. What are the biggest day-to-day challenges for you and what have you devised for strategies to cope? My biggest challenge is keeping up with my family and friends. I have an especially difficult time when it comes to eating. I rely on a feeding tube to get my nutrition because of a combination of Gastroparesis (stomach paralysis) and due to an extensive list of food allergies. I go into Anaphylaxis if I accidentally come in contact with an allergen. When I do eat, I make sure that I'm not home alone in case something goes wrong. Do you have a good friend support system? Have you been able to create an online support community through Brynn's Bubble? Do you ever feel that it's difficult to relate to people your age who are "healthy" or "normal"? I am very thankful to be able to say that I have an outstanding support system. I've made hundreds of great friends through Instagram (my username is @BrynnKaitlin)! What started out as meeting a small handful of other individuals with chronic illnesses has turned into a community of hundreds of people that I absolutely love. Once my health declined, it became difficult for me to relate to others my age. Friends come and go, but when you're living with a chronic illness you tend to lose more friends. I have no idea where I would be without the amazing friends who have stood by my side through thick and thin! Can you tell us about how Moose came into your life? The day I met Moose was one of the happiest days of my life. When our old family dog passed away, I immediately wanted another dog to keep me company. It took years of begging, but my parents surprised me with Moose at the beginning of 2012. I will never forget the day that my parents walked through the door with my sweet chocolate Labradoodle! Living with chronic illness can be truly exhausting: has having less energy or "good days" made you shift your priorities? What are the most important things in your life now -- as opposed to before? My priorities definitely shifted with my change in health. My energy level is not nearly what it used to be, so when I'm having a good day I make sure to pack as much fun into the day as possible. I never know how much time will pass before I have another great day, so I live them to the fullest! If you could reach out to every young person with chronic illness, what would you tell them? Whenever a young person is diagnosed with an incurable illness, it becomes so overwhelming and they may fail to realize that it will get better. Even if you have a progressive disease, you will reach a point where you come to peace about it. Life has ups and downs -- patients with chronic illnesses know that better than anyone! Just don't let yourself get caught up in the struggles any more than necessary. In terms of research, treatment and cures for your condition(s) what would be the most incredible thing for science to offer you in your life time? The best thing that could possibly happen to any patient with a rare illness is awareness. With awareness, we create a pedestal that has the potential to lead to better treatments and maybe even a cure. In my particular situation, my diseases are known as "invisible illnesses". On the outside, I look perfectly healthy. If it weren't for feeding tubes and central lines, it would be impossible to recognize that something serious is going on inside my body. I would love for people to understand that just because someone looks healthy doesn't mean that it is the case. Just as the old saying goes, "Don't judge a book by it's cover." From what I've read, it seems like the prognosis for Mast Cell Disease/Ehlers-Danlos Syndrome is maybe a little bit up in the air -- knowing that, how have you handled the inevitable questions about "the future" and what you'd like to do? Where you'd love to be in five, 10 years? Great question! My prognosis is definitely up in the air. If I am ever magically cured, I would love to be a nurse to have the opportunity to help other patients in the ways that nurses have helped me! Right now I'm just focusing on getting my high school diploma. I should have graduated in 2012, but with the 30 hospital admissions I had that year it was just not possible. Late is better than never! 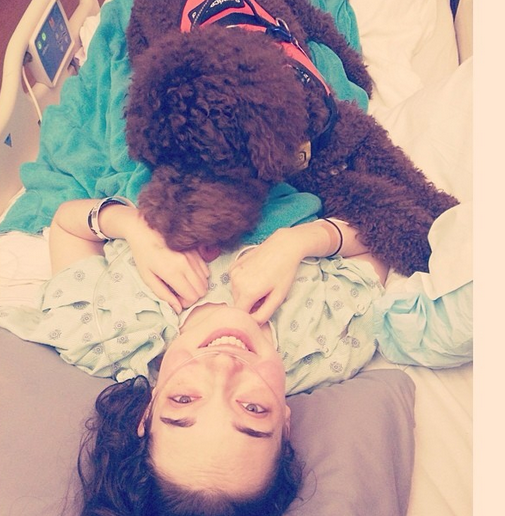 Brynn (and Moose) were in the hospital 30 times in 2012 -- not counting emergency room visits. 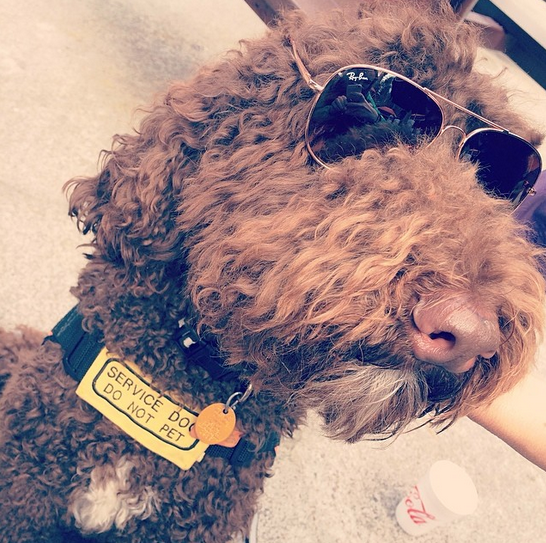 Moose is her service dog because he chose to be. In a video, Brynn put up about him on Youtube, she says, "I never asked Moose to dedicate his life to me, he just did." She met Moose as a puppy, just for a companion, and soon he became acutely aware of her health. He was already content to be always by her side, and one day, after he barked incessantly at Brynn's mother until she followed him down the hallway -- to find Brynn unconscious -- they decided to make him "official." So, he and Brynn went through service dog training and now, he is her medical companion, seemingly through his own doing. He accompanies her on outings, and especially to the hospital. His presence is a comfort to her no doubt, but his uncanny ability to predict her anaphalaxyis, fainting or seizures has also made him a literal life saver for Brynn. She's only been out of the ICU for the most recent time (a seven-week stay) for a couple of months, but she's already thinking ahead -- and thinking positively. Her Instagram gives us glimpses into the simple moments that make life special: a beautiful fall day, the sneaking of a little candy corn while she gets her food through a tube in her stomach, hospital photos that are cheery -- even if the brightest part of them is her smile. Even during the weeks she was in the hospital, she took the time to post thank-yous to her well-wishers: and there are thousands of them. They send love, faith and hope from every corner of the world. "Brynn, you are probably the strongest woman I have ever met/heard of" says one. "Hang in there, girly. We are all here for you." Says another. Comment after comment, I realize that there are so many people who see what I see in Brynn. Just by being herself and staying true to her journey, even though it has been extremely difficult, she has influenced so many people who she may never even meet. For me, in my small corner of the world, seeing her post about her day, or about Moose, always reminds me that to have a "good life" we can't let ourselves get hung up on things that don't last, whether it be money, or health, our youth, the expectations of others, the expectations that society might have for us -- what matters most is the way that our truth speaks for us, and what it says to us when we're scared and uncertain -- and what it says to others when they are. Even though I've never met Brynn in real life, from miles and miles away I can feel the warmth, brilliance and hope that she is giving the world.